Becoming a featuring vocalist at the nightclub where she began performing by 1918, Etting met gangster Martin Snyder, better known as “Moe the Gimp”, for his gimp left leg. A naïve young country girl in the city of Chicago, Ruth became reliant on Snyder as a manager. Soon, Snyder divorced his first wife in order to marry the young Etting, who later claimed she agreed “nine-tenths out of fear and one-tenth out of pity”, and became her manager for most of her up-and-coming career. Etting and Snyder were married July 17, 1922 in Crown Point, Indiana. His forceful management of Etting’s career was responsible for putting Ruth on the map, getting her gigs on radio, and eventually records. 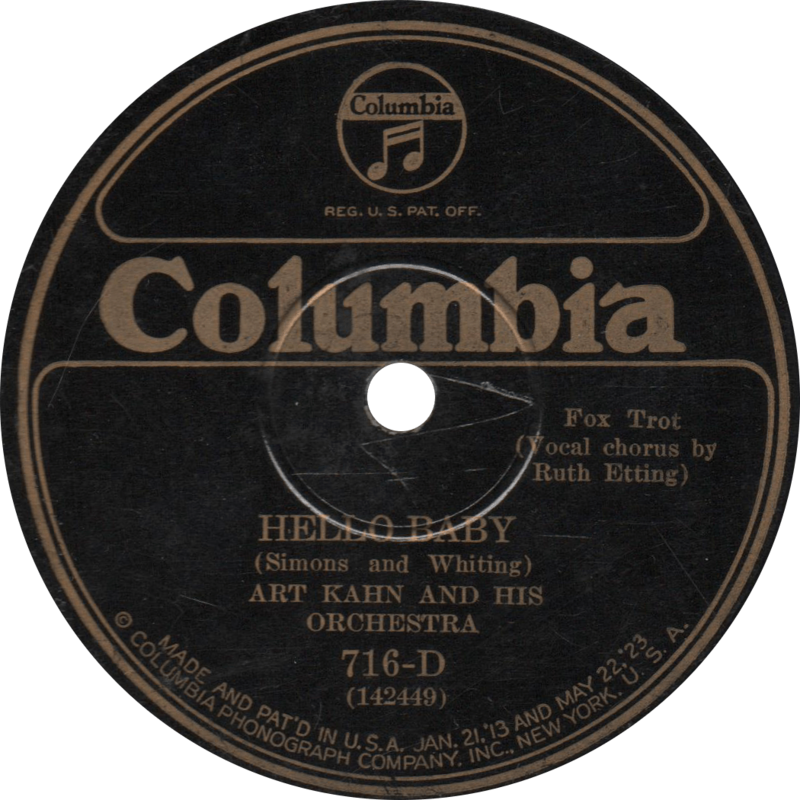 Hello Baby, recorded July 27, 1926 by Art Kahn and his Orchestra (Vocal Chorus by Ruth Etting). One of her earliest records. 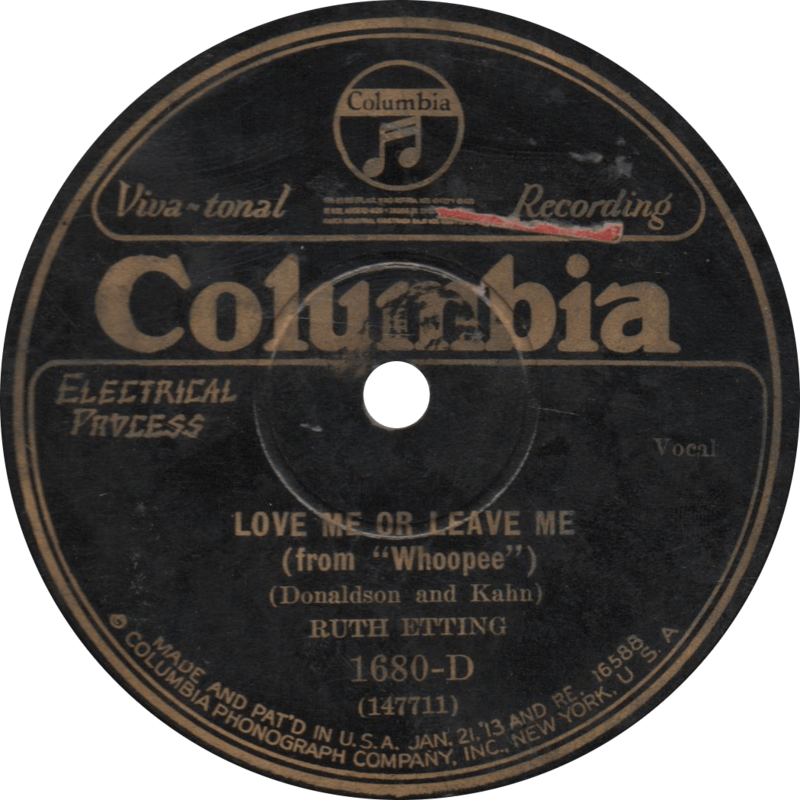 Love Me or Leave Me, recorded December 17, 1928 by Ruth Etting. One of her signature recordings. Beginning with the short film “Blue Songs” in 1929, Ruth Etting began appearing in motion pictures. Her first feature film was the 1933 picture Mr. Broadway. Also in the same year, Etting appeared in the Eddie Cantor vehicle Roman Scandals. Between 1929 and 1936, Ruth Etting appeared in four feature films and around thirty-eight shorts. After an exclusive contract with Columbia records for five years, in 1931 Etting signed with the American Record Corporation to record for their budget labels (Banner, Perfect, Romeo) and split her recording between the two companies until 1933. She then began recording for Brunswick until 1934 and returned to Columbia through 1935, after which she began a contract for Decca, with whom she remained until the end of her singing career. 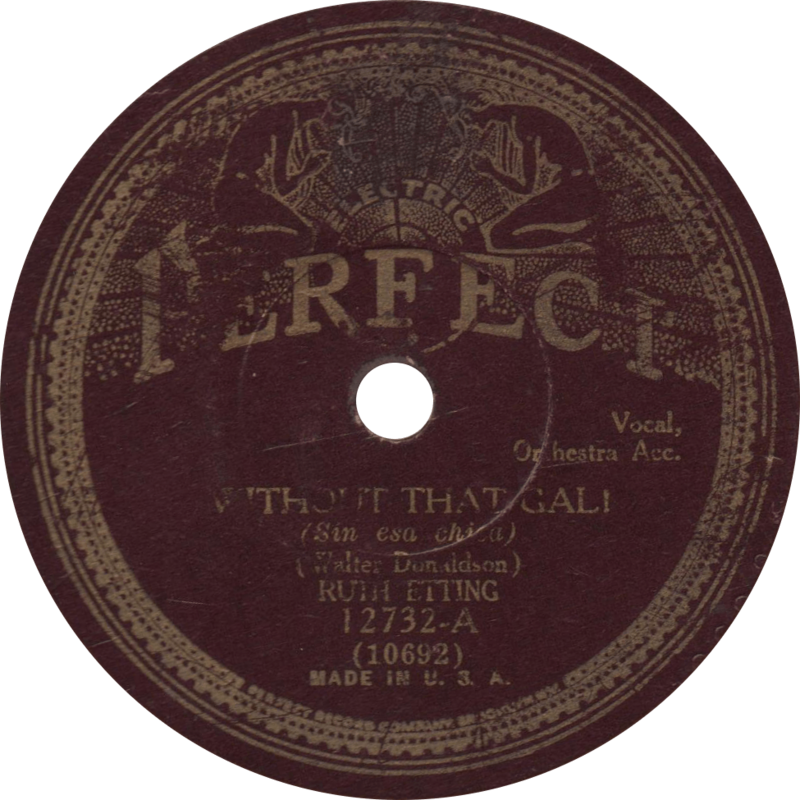 Without That Gal, recorded June 9, 1931 by Ruth Etting during her ARC period. Etting initially announced her retirement in 1935, though she did not follow through with those plans. With husband Snyder becoming more and more controlling and aggressive of her career, Ruth filed for divorce in November 1937, citing cruelty and abandonment. After the divorce, Etting began a relationship with pianist Myrl Alderman, who was at the time separated from his wife. Oh, the trouble that would bring. Moe Snyder began making threats by telephone to Ruth and her lover. Later, Snyder forced Alderman to lead him to his ex-wife, and held both of them, plus Etting’s daughter Edith, at gunpoint, saying he intended to kill all three of them. Alderman attempted to speak, and Snyder shot him, at which point Etting slipped away to retrieve her firearm. After Snyder wrestled the gun away from Etting, at which point their daughter picked up the gun and fired at her father, hitting the floor instead. Snyder was accused of the attempted murder of the three, as well as the kidnapping of Alderman, and the violation of California gun laws, he was convicted of attempted murder and was released upon appeal after a year, then returned after failing to post bail. Alderman dropped further charges against Snyder in 1940. Ruth Etting in cigarette girl costume, featured on an early 1930s Perfect Records sleeve. Mere days after the shooting, Myrl Alderman’s wife, Alma, whose divorce from Myrl would not be final until December, filed suit against Etting for alienation of affections. Alderman had falsely claimed to be married in July 1938 in Tijuana in an attempt to protect themselves from Snyder, and Alma claimed that any such marriage was invalid. 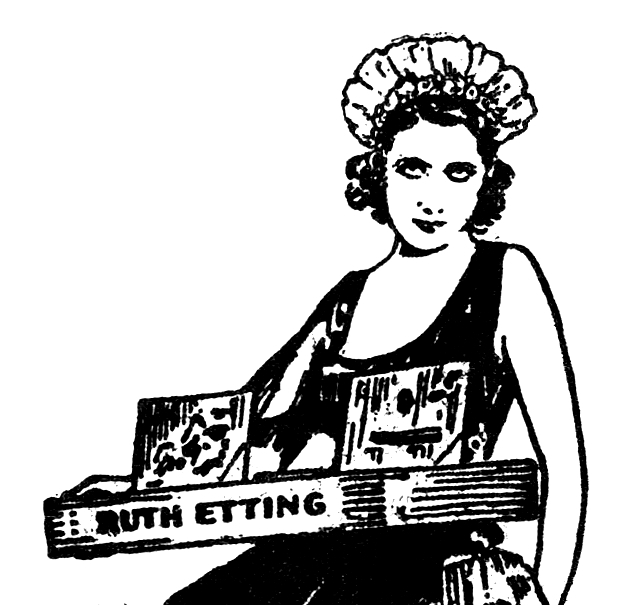 The lawsuit against Etting dragged on for over a year, and after presenting Alderman’s first wife, the court ruled in favor of Ruth Etting in December 1939. Etting actually married Alderman in Las Vegas during Moe Snyder’s trial. 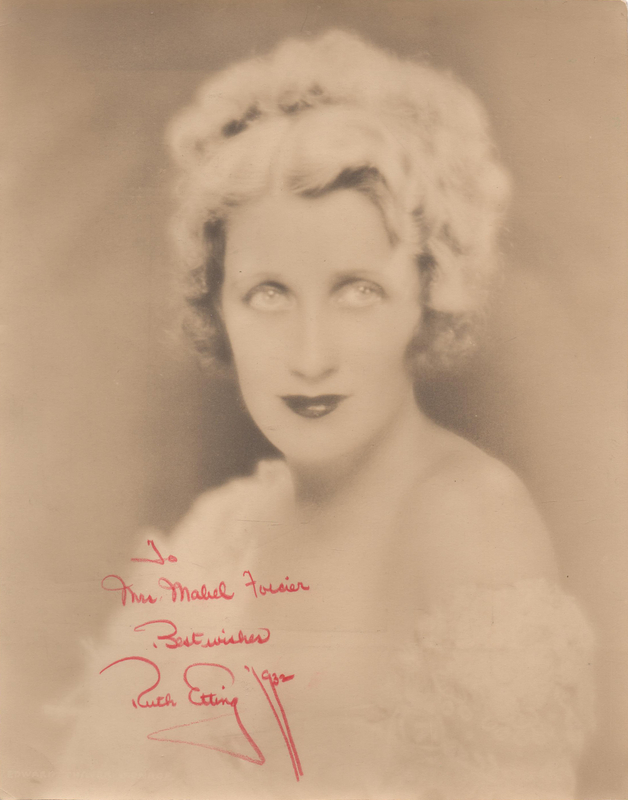 Around the time of all that debacle, Ruth Etting essentially retired from performing, moving with new husband Myrl Alderman to a farm in Colorado, where Alderman ran a restaurant in Colorado Springs. They remained there until Myrl’s death in 1966. Etting returned to singing on several isolated occasions, but never returned to the popularity she once knew. Ruth Etting died September 24, 1978 at the age of 81. This entry was posted in Spotlight and tagged 1920s, 1930s, ARC, Columbia, Jazz, Motion Pictures, Popular, Radio, Ruth Etting, Vaudeville by R. Connor Montgomery. Bookmark the permalink. My Grandfather was a professional musician with George Gershwin. He was an enterprising handsome man bringing Etta to his home to meet his wife. Etta would sit with my Mother, as a little girl, in her lap. Grandmother later found that they were having an affair and kicked my Grandfather out. Etta claimed she was married to a mobster at the time and that there was danger at home. She didn’t feel safe. Soon after Etta fled to Colorado to parts unknown for her protection.